Portsmouth will try for their first win in 2019 Saturday vs. the Clay Panthers. The Minford Falcons (4-0, 1-0 SOC II) picked up another win Wednesday night over SOC II foe Oak Hill, 9-0. Ace Ethan Lauder pitched a great game with 6.2 IP while allowing seven hits with zero earned runs and just two strikeouts. Senior catcher Luke Lindamood led the Falcons at the plate Wednesday night by going 2/4 with 3RBI in the Falcons win, while fellow senior Darius Jordan finished 2/4 at the plate with 2RBI in the win. Minford will take an off day Thursday before facing Oak Hill again on Friday in a road trip to try and best the Oaks. Wheelersburg (1-1, 1-0 SOC II) picked up their second win over the season, their first conference win in a road trip to McDermott to face the Northwest Mohawks (1-2, 0-1 SOC II) Wednesday night. Wheelersburg will face Ironton Thursday at home to try and pick up their second win of the season while Northwest will face Southeastern Thursday night to try and do the same. In their third game in as many days, the Valley Indians (2-2, 0-1 SOC II) fell to the Waverly Tigers (3-1, 1-0 SOC II) in their first game of SOC II play. For Waverly, Derek Eblin picked up the win, his second of the year, by allowing just three hits while striking out four batters in the win. Trevor Penrod finished 2/4 at the plate while Tucker Tackett finished 2/3 with two RBI. Valley take a day off Thursday before hosting Waverly on Friday with a chance at revenge against the Tigers. After being rained out Monday, the Portsmouth West Senators (1-0, 1-0 SOC II) travelled to South Webster (0-4, 0-1 SOC II) for their season opener and were victorious over the Jeeps by a score of 9-3. Cade Powell and Dylan Bradford led the Senators on the mound in their first win of the season. Powell finished with 3.1 IP, allowing zero earned runs and striking out eight batters. Bradford finished with 2.1 IP, zero earned runs with eight strikeouts. Luke Bradford went 2/4 at the plate with 4RBI while Luke Howard finished 3/5 at the plate with 3 RBI. 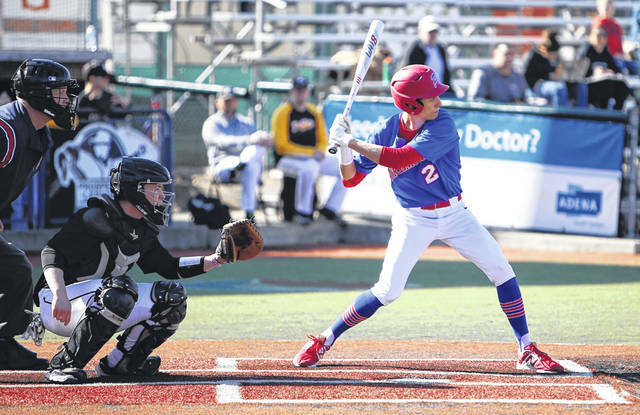 For South Webster, junior Gabe Ruth finished 2/4 at the plate with a team high 2RBI in the loss. The Senators will face Notre Dame tomorrow while South Webster travels to Green to face the Bobcats. Portsmouth (0-2, 0-0) dropped their second game in as many night’s to Division II’s Miami Trace at the VA in Chillicothe, 11-1. Bryce Wallace finished Wednesday’s game 1/3 at the plate with the Trojans lone RBI. Portsmouth will be back in action on Saturday when they will face Clay with a chance to pickup their first win of the season. The Clay Panthers (3-0, 1-0 SOC I) had yet another strong performance on Wednesday, besting SOC I foe Western 15-3 at home. Sophomore Shaden Malone got the win for Clay by going 2.1 IP, allowing just one hit while striking out four Indians. Reece Whitley finished with 1.0 IP, no hits allowed, and two strikeouts in Clay’s fourth win of the season. At the plate, sophomore Clay Cottle proved huge by going 2/3 and driving in four runs, while Whitley followed in going 2/3 as well with 2 RBI. Clay will try to improve to 4-0 on Thursday when they will face Paint Valley at the VA in Chillicothe. In their second game in as many days, the Green Bobcats (1-1) fell to the Rock Hill Redmen 6-4 in their final game of the Wooden Bat Tournament hosted by Rock Hill. As McDavid mentioned, Ponn and Carver did well again at the plate, even in defeat. Ponn finished 1/2 with a double being his hit, as well as having 2 RBI while Carver finished 3/4 at the plate with a long RBI being his own. Green will host South Webster on Thursday in their home opener for the 2019 season. The East Tartans (0-1, 0-1 SOC I) fell to Symmes Valley in their opening game of the 2019 season by a score of 12-8. The Tartans were led on the mound by Tyler Winston who finished with 4 IP, seven hits allowed, six strikeouts, three batters walked, and six earned runs. At the plate, Winston also had an effective game going 2/3 while driving in three runners for a team high 3 RBI. Teammate Brock Bradley also finished 2/3 at the plate while also scoring three runs. East will travel to Ironton to face the Flyers of Ironton St. Joe on Thursday to potentially pick up their first win in 2019. In their first SOC I game of the season, the Notre Dame Titans (0-2, 0-1) fell to the Eastern Eagles 9-7. Notre Dame will try and regroup Thursday evening with a road game against West in an attempt to pick up their first win of the 2019 season. The Panthers (2-0, 1-0 SOC I) became the fourth program in OHSAA history to win 800 games with an 18-0 drubbing of Western (0-2, 0-1 SOC I) Wednesday evening on the road. Leading Clay to the win in the circle was Preslee Lutz, who threw a five-inning no-hitter, striking out eight. At the plate, Cassidy Wells was 1-for-2 with a home run, Hannah Oliver was 1-for-2 with a homer and three RBIs. Megan Bazler scored three runs and both Lila Brown and Elisa Collins stole two bases each. The Tigers (1-0, 1-0 SOC II) started their season with a 14-run win over the Indians (0-2, 0-1 SOC II) at home. Waverly’s Hannah Robinson picked up the win in the circle, throwing five innings three innings, allowing a hit and whiffing eight. At the dish, Hailey Robinson was 2-for-2 with two homers, three runs and six RBIs while Hannah Robinson followed by finishing 2-for-3 with a home run, two runs and two RBIs. Kenzie Penrod also helped out, going 2-for-3 with a double and three RBIs. The Pirates (2-0, 2-0 SOC II) had no trouble with Northwest (0-2, 0-2 SOC II) Wednesday night, pounding out 16 hits in a five-inning victory. Mallory Bergan Wheelersburg’s offense, going 2-for-4 with a home run, two runs and four RBIs while Brynley Preston followed right along, finishing 1-for-1 with a homer and three RBIs. Christen Risner was 3-for-4 with a double and three runs, and Rylie Hughes was 2-for-2 with two doubles and two RBIs. In the circle, Sydney Spence picked up the victory, throwing all five innings, allowing three hits and whiffing 11. The Senators (1-0, 1-0 SOC II) started their season on the right foot Wednesday with a two-run win over South Webster. Leading West to the win in the circle was Kaleigh Parr, who threw a complete game, allowed three earned runs on 10 hits and struck out a batter. At the plate, Haivan Dillow was 2-for-4 with two runs while Laney Ayers went 1-for-3 with a run. As for South Webster (2-3, 0-1 SOC II), Kaylea McCleese was 2-for-3 with a run, Gwen Messer was 1-for-3 with a triple and an RBI, Mack Keller was 3-for-4 with a double and a run, and Rylee McGraw finished 2-for-4 with a double, a run, and an RBI. In an SOC I matchup, the Bobcats (1-2, 1-0 SOC I) earned their first win of the season Wednesday. Rachael Cline had a big day at the plate, going 4-for-5 with a double, three runs and four RBIs. She was followed by Ava Jenkins, who was 2-for-4 with a double, two RBIs and four runs. Cass Kellogg finished 4-for-4 with a double, a run and four RBIs, and Charlie Blevins went 3-for-5 with two runs and an RBI. For New Boston (1-1, 0-1 SOC I), Sammi Oiler was 3-for-4 with a home run, a double, two runs and three RBIs, Taylen Hickman ended the day 2-for-4 with two RBIs, and Brooklyn Hoskins finished 1-for-3 with two runs and two RBIs. The Trojans dropped a non-conference contest to Manchester Tuesday night by one run. Leading Portsmouth’s offense was Madison Perry, who was 3-for-4 with two runs while Jacqueline Bautista finished 1-for-4 with a double and a run. The Titans (1-0, 1-0 SOC I) started their season with a 15-0 drubbing of Eastern (0-4, 0-1 SOC I) Wednesday. In the circle, Cassie Schaefer picked up the win, throwing five innings, allowing no hits and striking out six. At the plate, Taylor Schmidt was 5-for-5 with three doubles, three runs and an RBI while Claire Dettwiller was 3-for-4 with a double, three runs and two RBIs. Maddy Suter also helped out, going 3-for-4 with a double and four RBIs. The Tartans (0-3, 0-1 SOC I) fell to Symmes Valley (3-0, 1-0 SOC I) Wednesday in five innings. Leading East’s offense was Hannah Ginn, who was 1-for-3. Sydnee O’Connor and Felicia Smith scored the Tartans’ two runs.